The first volume of Deac Rossell’s long-awaited history of the magic lantern – an important work for anyone seriously interested in the subject – is finally out. There have been earlier scholars, such as Franz Paul Liesegang, John Barnes and Hermann Hecht, whose contributions Rossell acknowledges in his preface (though omitting David Robinson, and listing Laurent Mannoni only as a museum person), but although he cannot totally revolutionize the versions his predecessors provided, Rossell adds scope, precision and new details, relying on an almost obsessive quest for archival evidence. Research is Rossell’s greatest asset. Much writing on ‘pre-cinema’ relies on easy-tofind, often unreliable, published histories; although Rossell knows the work of earlier scholars, he largely bypasses their analyses and goes to the original sources, which is painstaking and time-consuming, but also gratifying for the reader. Although Rossell modestly admits that his book ‘attempts to bring together into a single narrative parts of lantern history that have previously been treated separately’, and that many pieces of the puzzle he has been trying to solve are still missing, what emerges is a solid, ambitious and reliable account, a pedestal for future researchers to build upon – for I am convinced that there are things to add to Rossell’s research. 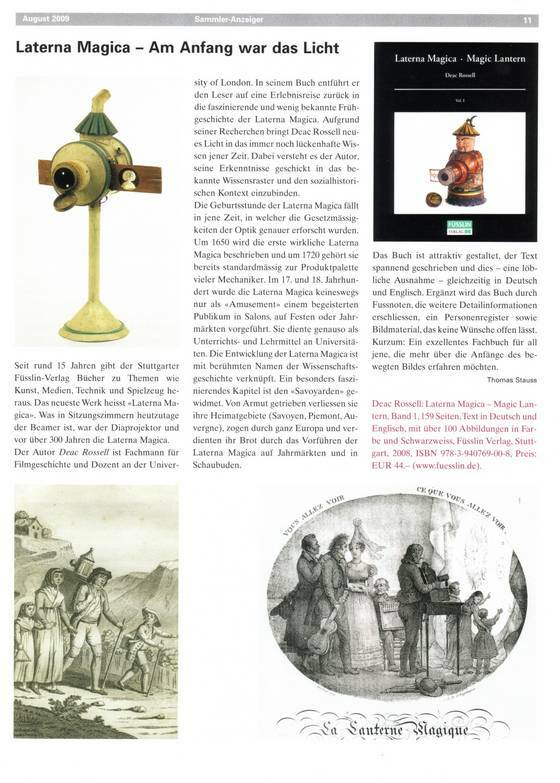 What we have at hand only tells the history of the magic lantern from its (still) somewhat obscure origins in the mid-seventeenth century to around 1800. Save for a few names (Kircher, Huygens and Nollet, as well as the cultural figure of the itinerant Savoyard with the lantern on his back), this period is little known even to sophisticated magic lantern enthusiasts. As preserved artefacts from this era are so rare and detailed accounts so few, received knowledge has consisted mostly of a handful of fixed ideas. Rossell corrects the situation once and for all. The first one and half centuries of the magic lantern come alive with phenomena and figures that one has never heard of as their stories have been hidden in archives (and there must be more in the vaults). A good example is the career of Johann Franz Griendel (1631–1687), an early lantern manufacturer and demonstrator, whose work influenced the well-known accounts by Johann Christoph Sturm and Johannes Zahn. Indeed, three lanterns (possibly the earliest surviving examples) in the collection of the Landgraves of Hessen in Kassel were probably manufactured by Griendel.Rossell also tells of Abraham Weber, who gave a lantern exhibition at the Leipzig Easter market as early as 1677, demonstrating how soon popular exhibitors gained access to the new device. 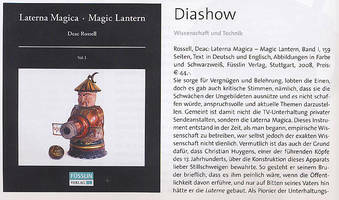 While not abolishing the existing idea of the magic lantern’s simultaneous existence in the cabinets of the curiosities of the learned and in the hands of the itinerant showmen, Rossell adds color and details to these parallel histories, also demonstrating that, contrary to previous thinking, the ‘serious’ uses of the lantern were more or less continuous throughout the eighteenth century. I applaud the way Rossell uses a variety of sources to support each other, moving with ease from archival documents and early books to surviving lanterns, slides, paintings, prints and all kinds of ephemera. This is a necessity because in spite of their near-ubiquity, magic lantern shows did not enjoy a similar status to wars and diplomatic events in the eyes of contemporary chroniclers – only surviving as fragments of information that have to be brought together for a coherent structure to emerge. Rossell’s third chapter effectively reconstructs the history of the travelling Savoyards – a familiar, but elusive phenomenon throughout Europe at the time. He shows how the itinerant Savoyard was turned into a stock figure by the French painter Christoph Huet, who created influential singerie imagery (the touring ‘monkey lanternist’) and provided the sketch for the Meissen porcelain factory’s well-known lanternist figurine. In a similar way Rossell draws connections between many previously discrete (arte)facts, weaving a cultural ‘magic lantern web (or tapestry)’. A casual reader may find his book somewhat pedantic, but it is exactly what magic lantern scholars and enthusiasts have been waiting for. The rich and rare 100 plus illustrations support the text beautifully and make the book even more valuable,1 as does Fuesslin-Verlag’s decision to publish in English as well as German. Still, no history book can be absolutely ‘complete’. There are always things to add and interpretations to contest, as Rossell himself readily admits, so I will mention a few. Despite the very small number of surviving magic lanterns from the first 150 years, several interesting lanterns are not mentioned. The most important omissions are the spectular early lantern night (projection) clocks in the collection of the Landgraves of Hessen, currently on display at the Orangerie in Kassel, one of which doubles as a magic lantern (it is even displayed with an early lantern slide in its slot); the gigantic demonstration lantern (pre-1766) preserved at Harvard University; another example of the early British ‘London’ design in the University of Aberdeen (and a third, incomplete one in the Richard Balzer Collection); and a better preserved example of the itinerant Savoyard’s lantern, with carrying case and a set of ‘long’ slides, in the Jack Judson Collection. The book leans very heavily on the discussion of the ‘hardware’ (the actual lanterns), while the ‘software’ (slides) receives only sporadic attention, except in the third chapter on the Savoyards. Quite a number of early slides have been preserved in private and public collections; only a few examples are mentioned here, without any real analysis. For a ‘complete’ history of the magic lantern, one wishes somebody would write a companion volume to the present one, providing an analysis of early slides. Rossell’s book is very dense, giving very little space for wider cultural-theoretical reflections of the phenomena it so meticulously describes. The approach is empirical in a way that interestingly combines the British and German traditions. A bit more space dedicated to general cultural reflections and ‘local color’ would have made the book more appealing for the general reader – but, of course, longer and more expensive. Overall, the book is a tour-de-force, and its publication an event in the studies of early media culture and media archaeology. I hope I will not have to wait too long for the next volume. Still, serious research takes a while … but the results resist the effects of time. Some of us have been waiting for this book for a while -- in recent years, it seems that most of my dealings with Deac Rossell have included a gentle enquiry as to how ‘the book’ was going, and a reassurance in return that it would be appearing ‘soon’ or ‘later this year’. It’s a great pleasure to see it finally become a reality, and it doesn’t disappoint. Billed as the first volume of an intended three, this history of the lantern takes us in reasonably chronological sequence from the mid-seventeenth to the early nineteenth centuries, with the exception of the Phantasmagoria which is to be covered later. In some respects this is a fairly familiar story, at least for those of us who have pottered around the subject for a while and read Mannoni, Hecht and Liesegang among others. Huygens (very carefully described as ‘the man with connections to many of the earliest known magic lantern activities’, neatly avoiding any distracting ‘inventor’ debates) and other familiar names from the early years are treated in a chapter; the next chapter outlines numerous mainly technical developments in the eighteenth century; and Savoyard and other popular exhibition practices are covered in a third. What sets this apart from any previous work is its refusal to ‘take things as read’ or accept the usual gaps in our knowledge as inevitable. Sometimes this means reinterpreting familiar sources; sometimes new discoveries are presented, many of them (necessarily given Rossell’s research interests) relating to Germany and the German pioneers, a very welcome development in itself. Prominent among the dramatis personae is the (until now) slightly shadowy character Johann Franz Griendel (1631-87) of Nuremberg, whom Rossell describes as ‘one of the most important figures of the earliest period’. He makes his case well, linking Griendel to many of the other early lantern practitioners, demonstrating his influence on the early lantern designs whose illustrations we know from more familiar sources (with a rare surviving example, Fig. 1), reproducing a list of his wares from the 1670s(!) and even managing to conjure up a portrait. 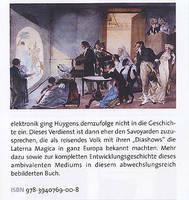 But even the relatively well-known references and illustrations, like the 1765 engraving by Johann Eleazar Schenau (MLS members may know this from The Lantern Image, item 52), are discussed and given a historical explanation that I can’t remember reading in the other places they have appeared, including the Society’s own books. This Schenau image is a good example of Rossell’s approach: he examines every detail and then considers it in context, pointing out that the screen image shown (‘an old witch being led off by devils with a bat hovering above’) is actually quite unusual for its time, since ‘engravings of the travelling lantern shows in the second half of the eighteenth century only occasionally show ghostly, devilish, or superstitious objects’. That’s an interesting point, and one that only a broad knowledge and a questioning researcher would bring to light: more conventionally such an image could be blindly accepted as evidence of a ‘typical’ lantern show. The illustrations, certainly, are a striking feature of the book, and not simply because there are so many and they’re so well reproduced (though if I might quibble slightly, numbering of the pictures and numbered references in the text would be helpful). What really strikes the eye, especially an eye that has seen a few magic lantern books in its time, is how downright unusual these illustrations are. My favourite is perhaps one of the more prosaic objects: a rough-and-ready Savoyard lantern of c.1820 (Fig. 2), complete with its battered travelling box, a worker’s lantern that says more to me about its maker, owner and audience than any ten of the pretty lacquered drawing-room ornaments we’re more used to. Where have all these wonderful discoveries -- rare lanterns, astonishing early slides, unfamiliar engravings and so on -- been all this time? One answer lies in Rossell’s acknowledgement to his publisher Georg Füsslin, noting ‘Füsslin’s enthusiasm as a collector and his involvement in a wide circle of other collectors on the Continent’. A browse through the picture credits -- a high proportion are to the wonderful Binetruy Collection -- is instructive in itself. There are plenty of good small and specialist publishers around, but I can’t think of any whose output consistently demonstrates higher standards of content and production than those of Füsslin Verlag. That this book is superbly produced, heavily illustrated, well translated and edited and nicely laid out, says a lot for the love that has gone into its creation. This doesn’t, it has to be said, come cheaply. At just 160 pages -- in fact, about half that in terms of text, since it is presented in parallel German and English -- the book seems to come and go quite quickly, and the cover price of 44 Euros would buy a slide or two or several hot meals. But given the going rate for specialist illustrated hardbacks these days, I can’t complain about value for money in any mean words-per-Euro fashion. There’s a lot more that could be said about many of the subjects covered -- though to be fair not enough is generally known (yet) about a good few of them -- but Rossell’s writing is comprehensive enough to avoid the sense of missing something. It’s consciously no more than a summary, but it also manages to expose a remarkable degree of detail -- as a summary, it manages to convince the reader that the author does actually know the detail and depth of the subject but is concentrating on what’s important to the story at hand. There’s no sense of ‘fast-forward’ jumping over gaps, which most historians will be aware is all too tempting and easy. Instead Rossell gives us the important outline developments and, to some extent, issues a kind of challenge to the rest of us would-be lantern historians: if we really feel there’s a need for a more detailed account, why not do something about it? Laterna Magica is a great read -- informative, clear and elegantly written, fast-moving and engaging. It’s intended as a compliment that my one abiding regret is that, perhaps a little greedily, I wanted to read more of it. Reaching the end of Volume 1, I started again at the beginning and enjoyed it just as much the second time around.